It’s not really hard to believe that how much can be achieved due to the recent progress of science in the area of 3D printing; these great accomplishments have come about in short periods of time. This time 3D printing brings us something really unique, scientists have finally established that functional electrical components can be made using 3D printing; this includes 3D printed sensors as well. The researchers have made a 3D printed wireless smart cap. 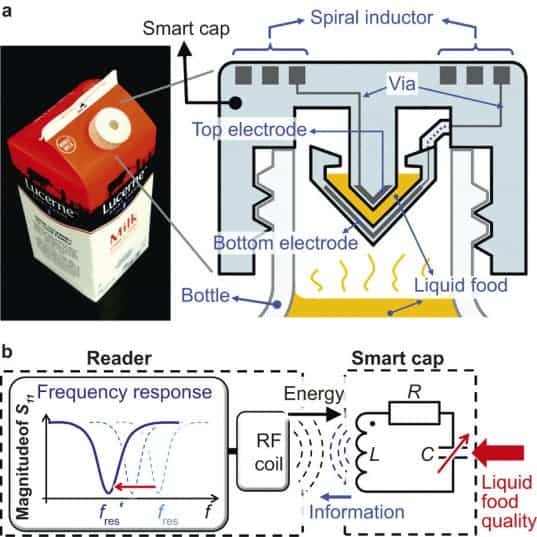 In the US, some researchers from the University of Berkeley California, came up with a demonstration of a 3D printed wireless smart cap, specifically designed for milk bottles. This smart cap is used to inform the consumers whether the milk they are going to use is fresh or not by using the sensors embedded in the cap that detect whether there’s anything wrong in the milk, because it’s better to know before making a cup of tea rather than drinking rotten milk. Once these electronic sensors are fitted, all you need to do is to tilt the container upside down in order to check for any changes in the electrical signals being provided by the smart cap. The sensors are specially designed in a way which enables the smart cap to check and detect any abrupt or even slight changes in the milk which then make changes in the electrical signals due to increased levels of bacteria in the milk. Since it transmits the details in real time, this certainly explains how you can now check the freshness of food even before you buy it and specially before using it. The same researcher’s lab is also working for other potential health applications that can further improve the living standards, including those which can monitor high or extremely low blood pressures, muscle strain or applications of similar sort and nature. The post 3D Printed Smart Caps Will Tell You if Your Milk is Fresh by Ahmed Bilal appeared first on WCCFtech.